also I'm not a native English speaker, hence why my English its so weird, so i'm sorry, i know how Native English speakers are proud on their language and hate it when its wrong wrote. ...I'm not telling you to stop, though. I'm just saying that you spell it that way, so in the future, you'll know. By all means, please continue your playthrough. It's fun to read because I don't really own a 3DS, let alone SRW on it. Youta wakes ups inside the Nadesico, he is on the recovery block of the ship, he is greeted by Kyo sister who happens to be a nurse, he ask for Fallsaber, he is allright and already fixed, he don't know much about the robot that attacked them, but that he is a sentient mecha as well, its pointed out that they couldn't trace its AI, Yuki is still on bad shape. On another place Rhidde is with a boy called JoJo, there a huge wall on front of them (at least i think that's a wall..) Doris asks Audrey from where she comes from, Mineva answer that she born on space colonies, and points out that this place is strange, a old man approach Zeon Princess and talks that they have a sub-terrain domain here is this island (this is the island that appeared out of nowhere remember? the one full of sentient robots), JoJo believes that Rhidde is Mineva Knight, and he is a knight as well, Rhidde don't quite get it, after a huge staircase we arrive at a camp, there we find a girl that probably was named by Megimin from Konosuba, her name is Chururu, also the name the place those characters came from its Arst (??? 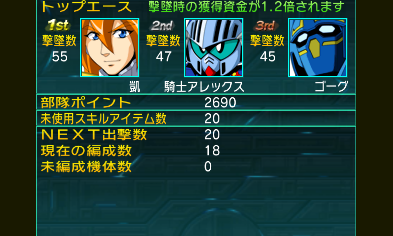 don't quote me on names, like i said i don't know the romanization of those) Chururu its with another Knight gundam. this time Knight Alex, he was also here on this place for sometime Yu recognize him as being one of Knight Gundam friends because of course, Mineva its quite confused about the existence of the chibby gundams (i'm too). back to the camp we know that the people of this place fight with Panzers, and also they think that Gorg its one of those, so we might find more about him on a certain place, so we decide to go to a extra suspect cave along with some old mans, Rhidde and Alex are outside in case of something goes wrong, Audrey ask for them and etc, Doris points out to Audrey that this place has some strange phenomenon happening, and its probably source of this island strangeness, we find Gorg there, Yu calls for it, as he see us the big robot goes out. a mysterious girl in red hair watches us she is probably a stalker, who follow woman and children into caves anyway? inside the cave Audrey finds a strange room, clearly man made, and there's a robot there that Jojo found, Doris tries to go into the thing, and the previous pilot body is there, surprise the guy is dead (now we G Gundam? O_O) as Doris screams Yu goes to check on her, Audrey ask wtf is happening because she had enough of robots going crazy on her lifespam, but that's only the beginning Gorg goes out of the cavern by itself letting the girls there on foot, JoJo says that the name of that Panzer is Galiant and the tittle of the map spoil us. 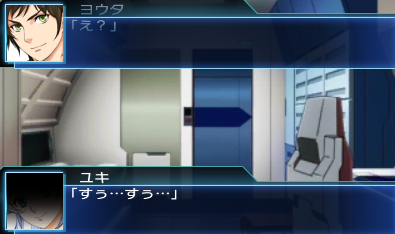 In Fact something WAS happening outside, never distrust you friendly giant robot, Hy arrived with some weird mecha, this game is fun, its full of weird mecha, Rhidde is there alongside Alex, and i was right its was a wall! Gorg goes out of the cave to help Rhidde and Alex to take out the panzers, and he is apparently a little out of control. well the map itself don't look hard there's 9 enemies and 3 units on our side, those are all new units save for Gorg, but Delta Plus comes full upgraded already, it should provide no problem, Knight Alex has 3 attacks and sightly lower status than his other friend, Gorg gained a new attack this time ranged, i do believe that each unit can take 3 Panzers easily and no strategy will be needed. The boss have around 30k hp, but its not that hard, all the units are pretty strong and he don't have a good change to hit you, i dueled him with Knight Alex while finished the other grunts with the other 2 it was not hard, animations still look pretty impressive for a portable game at this point. After this the boss heal himself, and a huge number of reinforcements appears, among them Lucca and Klan, Hy is finally here, he orders and all out attack the bombardment make everyone goes on defensive the panzers from the enemies destroy the walls to enter the cave. inside the cave JoJo and Audrey sense things exploding outside, JoJo wonders if the only way its going inside Galient, he goes inside thanks to a little help of our stalker, he them goes out destroying the 2 panzers and the boss after it, reinforcements arrives to us like it should. Alto recognizes Klan and Lucca and will convince them to come back to SMS (or something), the objective changes to don't let Alto be destroyed, and to complete the mission destroy Hy. now our 3 starter units are in a pretty bad position and it might be better to make them go back in formation if they survive the next turn that is. i was surprised by that lol. after the battle Hy is defeated and try to retreats JoJo pursuit him and hit his unit making him retreat, Lucca and Klan retreats with their new boss, when Ozma appears and challenge Alto to a duel, Alto its hit and its puzzles about what its happening, Ozma also retreats after covering the others. back at the camp the people think that JoJo its now some hero or something, Alto and Yuki (she recovered) are puzzles about Alto friends, them Alisha suspects that maybe they have no other option, and our mysterious stalker appears and say that she knows where the S.M.S is and we will be going there next apparently. after this i won some option that i think that its unique to BX i can set up some characters as Strategists of the team, amount them Flit,Falsaber, and the Dunbine ship captain, seems like they give different bonus on the maps i might see more of this feature. turns out that Soma and Alelujah are still with us, and they have something to ask, map ends. It is Arst, actually. And you're close with the guy, it's an L/R shift - he's Marder (like Murder, only with an a). Quote: a mysterious girl in red hair watches us she is probably a stalker, who follow woman and children into caves anyway? Galient mech designs are all really good. The show is by the same guy as Dougram, VOTOMS, and Layzner, and he does amazing designs. Wait until you see the Zaureru and the Monocot. Actually Knight Alex is joining now. He's technically the weakest of the SD units, but only slightly and he does support. You get Fencer Zeta in IIRC the really early 20s (he's with Celestial Being, he would have shown on an earlier route split), Warrior ZZ is hanging out with J from Gaogaigar, and Wizard Nu... Well, you'll see. Quote: after this i won some option that i think that its unique to BX i can set up some characters as Strategists of the team, amount them Flit,Falsaber, and the Dunbine ship captain, seems like they give different bonus on the maps i might see more of this feature. it's from UX. Though in UX, it really wasn't a choice system, it was "use Kongming/Zhuge Liang every time unless the secrets require otherwise." ...speaking of which, you are getting secrets, right? I really don't know if I'm triggering secrets the only thing that i'm doing its beating the bosses with the main characters of the series, but i do believe that i triggered some of them. You need them all to get to fight the True final boss, tough (the flags start with stage 9 so you are still in time to go back without losing much progress). a good thing on having this blogs, its when you stoop a game and retake it, you really don't remember what was happening, i just gone trough reading it again, and now lets proceed with BX. Guy have been pretty strong since the beginning, i think he is a little unbalanced he pretty much one shoot things since back them, Knight Alex was pretty much because of the last stage same for Gorg, i believe that those will not stay there too much time, but they're good units, just not GGG level i think. 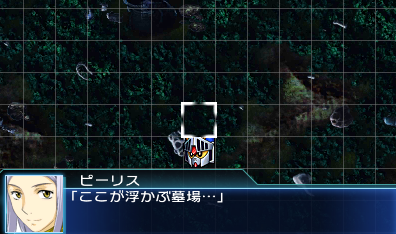 remembering we are still on the mysterious island that appeared out of nowhere bringing with it sentient robots among them the SD Gundam crew,Galient crew and Gorg, SMS attacked us and retreated. so lets get the boosters on. Back at the camp, Chururu its talking with JoJo when Akito begins to chat with Alelujah that probably Yurika will come up with a plan, Yuki and Yuuta are talking with Soma about the SMS when she notices a person watching them and shout for this person to appear, a random mysterious guy appear out of nowhere and greets Soma, seems like he knows JoJo. Hy and the others are making weird plans, they have to do something about Galient and they have to use a new thing. Back at the camp, the captains are not on the plebeians camp, but on the palace because of course! logic, Yurika don't formulated a plan by herself by Flit adds that its hard to make something up when he don't know the terrain and obstacles, that will not be a problem since THE KING know, he tell our characters about their war and bla bla bla, Rhide discovers that Alelujah and Soma are part of Celestial Being, and Alelujah being Gundam Maister, like one of the better gundam pilots and he pretty pumped to have meet one, their chat go back to the camp where he ask about the other members, and Yuki goes on asking Soma if she is also one of them, the other girls became hyped for you know, "she is a girl and its one of the best ones" ,Soma answer that yes she pilots, clearly confused by the kids around, Kyo ask Alelujah to help him get better, but all the chit chat ends when the next course its set. apparently next move its on, Windu (its the name of the random guy that was stalking Soma before), says that they will to the floating valley, SMS is there, however they need to infiltrate the place to save them, Soma and Alelujah are the super soldiers here so they will go do the job, however they don't have a unit to make things easier outside while they're on it, for distraction they will use Knight Gundam, the SD Robot will take them there and drop them on the floating valley, Soma and Alelujah infiltrate the base and save Alto friends,while Knight Gundam brings the enemy attention, so they will have less people to find them. the map is pretty, there's a lot of debris around here. Having lost almost all my HP on one of the firs turns i had no option but spam seishin and run away, the grunts move a lot and arrived, but well lucky sometimes strikes on the right moment. 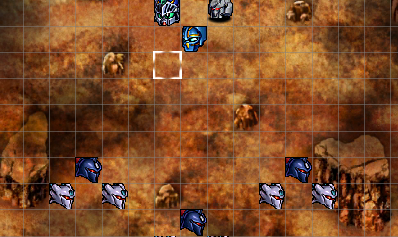 after the 6 initial grunts are defeated 6 more appears as reinforcements from the south of the map, however by now Knight Gundam probably already have his 120 will and passive On, so you can fight them with more ease than before. After this turn the captain of the enemies ask Knight gundam if he will still resist, he gives them no answer, inside the base Alelujah and Soma are searching and already putting some soldiers to rest,however as they advance more soldiers arrive and they are on a hard to escape situation them Alelujah switches personalities and bring them down. 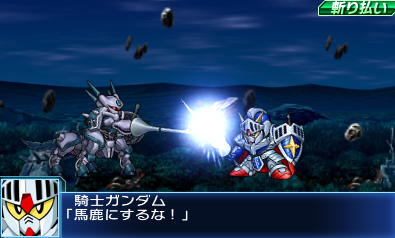 Outside Knight Gundam can't take much more punishment than this, however you must survive yet another turn. on the next turn despite Knight Gundam efforts he cannot keep up with the huge numbers of the enemy alone, looking at the scene was Windu that used a big set of bombs, and destroyed most of the enemy army, Knight Gundam retreat to near the place that Soma and Alelujah entered, Hy and the main forces finally arrive, and wow there are LOADS of enemies now. 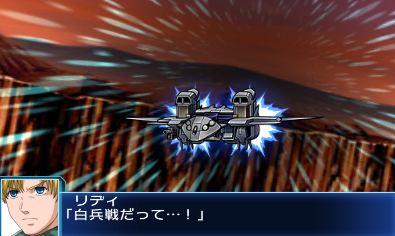 Ozma and Canaria and on a cell, Alelujah and Soma saves them, the Macross crew its all there. 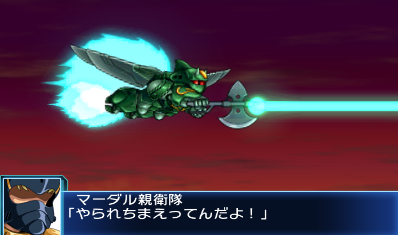 Outside Hy follows to put an end to Knight Gundam since its now weakened when a machine stand on his way, its a Dunbine thing and of course it attack Hy for some reason raising the numbers of RIPS on this blog, and the numbers of sentient robots of this game. after this our main forces arrives, and i finally have too many units to deploy everyone, our mysterious Aura Battler friend its a NPC allied unit on this map, let him do his thing he have 58k hp, but don't let him hog all your exp points! by this point on Macross Frontier,Michel,Canaria,Luka and Ozma are playable,just finish the map its not hard. be back to more BX latter today. 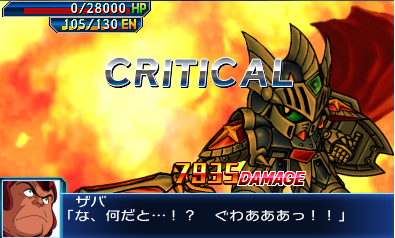 (06-18-2017, 10:25 PM)Mai Wrote: its a Dunbine thing and of course it attack Hy for some reason raising the numbers of RIPS on this blog, and the numbers of sentient robots of this game. That's the Zwauth. 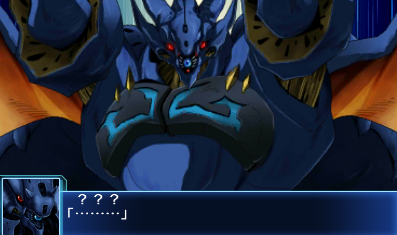 It's from Dunbine: Tales of Neo Byston Well, which is technically a plotless series in this game but really moves closer to Mazinger ZERO was in V (which was also considered plotless). You'll be seeing quite a bit of the Zwauth (note: Zwauth is different from Zwarth) until the midgame. "The Black Panzer" actually has one of the game's best plot points about it, too. 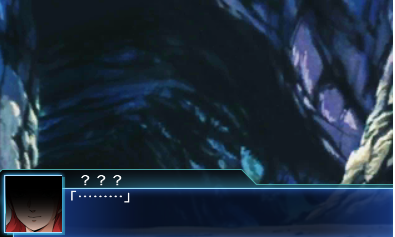 no i didn't finished this game, and you probably is asking yourself "Mai why don't you just finish X?" that's exactly it" i didn't finished BX or UX and i was playing X, i will never finish those two SRW games that way so i decided to give it BX and X a go first, we where on Map 14 and just got the Macross Frontier crew back now on to 15! Alto is worried about Sheryl now that he discovered via Ozma that she is under military house arrest, the problem is that they knew what Sheryl and Ranka did in the past, they voices can reach the Varja, they did it 6 months ago and the singers of the imigratory ship where taken by the military, Hilda wonders if its not because they like her voice so she can sing for the miliary there, Ozma cannot deny this, she also reports that something called "Iron fortress" is moving toward east, she tells that they're probably trying to move out of this place, stopping their movements will probably not be easy since they have even more mercenaries now. Of course the main characters are going to prevent they for reaching Earth, since some of them are members of the Earth federation and stuff, also Flit notices that should be their main goal, and not rescuing Sheryl she can be used as a hostage if things comes to worst, and if that happens, Kyo interfere and say to him to stop, Ozma says that only if its the worst case scenario, and even Alto its ok with flit orders. On the Hangar Alto talks with Leon and explains to him his situation with Sheryll and Ranka, and how he will save them regardless, and Leon and Alisha do understands him, but its not just that, he also flies because of them on the first place, both MC's understand it how precious it is tu protect what you love, Hilda them is asked if she will be deploying as well, she says that she prefers to do her job without losing money or risk anything. Arriving at the place the king is already out to go to Earth, he leaves Hi and his soldiers behind to buy him time, JoJo is adamant about making this place the last struggle between them, the enemies deploy Ghosts from Macross, Michel notices that someone send it to them from Earth, and Luka will rewrite them all but he the other to buy him 3 minutes, before its completely done. There's tons of units on both sides so i will just face them head on like on the good old times. Current time: 04-25-2019, 02:10 PM Powered By MyBB, © 2002-2019 MyBB Group.